100% (£10,000 + VAT) or shares of 25 or 50% in the Antonius Pius - Gavotte filly. There is nothing wrong with any of these and they are all having their first canters now having had a bit of time trotting while Rae was on holiday. Come along and have a look on a no obligation basis while they are still available. To make a time please call Liz on 01638 661508 or Rae on 07711 301095. 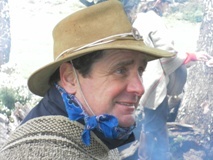 It has long been one of Rae's ambitions to see Argentina as the country has such a strong horse tradition through the Argentinian cowboys, the gauchos. 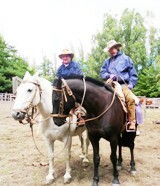 This week Rae and Rachel just got back from a fantastic trip to an estancia in Patagonia, in the foothills of the Andes, where Rae's cowboying talents were put to the test (Rae is on the grey on the left). It was a bit different from riding a racehorse as you can see, but it is a breathtakingly beautiful country. 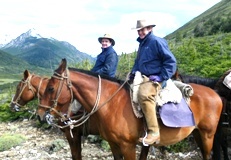 When camping in Lanin National Park (named for the volcano you can see in the picture, right); on horseback was really the only way to get there. The weather was a bit unpredictable with rain, wind and even sleet and snow at times, but there was sun too thank goodness. The terrain was testing, as we went through rivers, across volcanic plains and up and down mountains; but the horses were incredibly sure footed and expert at their jobs. After all that Rae has returned for a rest and is suitably refreshed and ready to get on with training these horses. The casual or not so casual reader may be considering investing in one of the two year olds we have here. Four of the horses originally offered for sale have now found new owners - the Pivotal, Shamardal and Peintre Celebre to a new partnership called the Chestnuts (all the fillies are); and Jim Duggan has snapped up the Whipper filly. So what about the others? People always ask what Rae thinks about them, so your editor took the liberty of seeing what could be gleaned from the horse's mouth. Rae says: "all three fillies are broken and ridden away - i.e. trotting and cantering - and doing well. They are all now qualified for the £10,000 Racing Post Yearling Bonus." "The Antonius Pius (pictured right in the snow) was the first yearling in and so we have had her a while. She has grown a lot, has become a really nice filly and is going very well now." "The Holy Roman Emperor is typical of her sire who was second leading sire of two year olds last year; and she looks a sharp early type." "The final one is a lovely Rock of Gibraltar filly from a good family. Having been originally intended for Tattersalls flagship October 1 sale, she is eligible for the eight Tattersalls Millions races. She has a nice attitude and is a very good mover." Conformation pictures of all the horses available for sale or lease appear on the horses for sale page on the bar to the left or via the home page. They are all here and available to be viewed in action on the gallops. Please call the office on 01638 661508 or Rae on 07711 301095 to make a time. 1 January saw all the horses turn one year older, so you will now see this year's two year olds featured on the two year olds in training section. Lastroseofsummer ran a very creditable fourth at Fakenham on New Year's Day. She probably didn't quite stay 2 mile 7 furlongs in the soft ground which looked much like a ploughed field by the time we got to the last race. It has been very difficult to get work into the horses that need to run over the recent (freezing) weeks as, although Jockey Club Estates' staff have been doing a great job of keeping certain canters open, it has often been too dangerous to actually get the very fresh horses to the gallop on the ice and packed snow. Nonetheless the indoor ride has been a godsend and they have all kept moving although perhaps neither as far nor as fast as they (or Rae) would like. Happy New Year and every success in 2011 to all our owners, staff and friends. Eamonn Duggan's Albany Rose ran a great race to win at Wolves on Friday, fulfilling the promise she had shown on her previous starts and at home, and becoming, somewhat belatedly, the yard's first two year old winner of the year. She is the first foal of Eamonn's mare Teide Lady and has already done rather better than her dam by winning at two and, in fact, actually winning a race (Teide Lady's win at Newcastle was achieved on disqualification of the winner). Not to say that TD was untalented - quite the reverse - she just had her own ideas about how things should be done. Her daughter proved a real battler on Friday, leading from start to finish. Let's hope she can go on to better things. Congratulations to all concerned.